Not quite up to the Dowry Creek level, but I loved the billowing cloud bank . . .
We saw our first dolphins today, as we came out of Newport River and turned into Bogue Sound. I didn’t do so well with the photography on this one — I was unprepared when they surfaced directly in front of our bow! Normally dolphins will speed toward a moving boat to ride the bow wave, but I’m guessing that at 8 ½ knots we didn’t provide the excitement that the speedy sports fishing boats do. They let us pass without paying us any attention at all. Crossing the Bogue Sound this morning we got a huge push from the current that was coming in the Beaufort Inlet, speeding us along at an unbelievable 10.1 knots. Somewhere along the way the current changed, and we dropped back to 7 knots going against the current coming in the Bogue Inlet, farther down the ICW. Take a look at the chart here and you will see “the magenta line,” indicating the ICW, and how it winds around some of the small islands at the inlet. Currents coming around some of those islands will sometimes be opposed to the current coming in the actual inlet itself, so our speed varies considerably, and OFTEN! The Sounds are associated with inlets from the ocean, and protected by barrier islands. The “Bogue Bank” seems to be heavily developed in some areas (look out FEMA!) In many places there is a second, smaller line of barrier islands, some of which are barely dry ground, but the birds love them. You can see the two barrier islands here, the closer one inhabited by birds. Look at the cormorant spreading his wings, just left of center. Bird feathers are hollow which gives them lots of insulation. But these guys dive deep for fish, holding their breath for over a minute, and after a while they get water logged. To the point where they no longer float! So they hang out like this, basking in sun, wind, air, until they can float again. Here is a Snowy Egret that we startled out of his fishing. . . .
And here a flock of cormorants who we chased down the channel. The rear guys would lift as we approached, paddling and splashing, fly ahead a thousand feet or more, and then settle with the flock coming in behind them. Only to lift again! It was like watching the water flow. We went through Camp LeJeune. . . never saw a person, but a large helicopter that Hans called the “Green Giant” flew overhead and circled us for a bit. The signs about “Live Fire” are real, and a bit daunting, yes? This was truly a gorgeous day, and we went through lovely areas. . . all different. It’s soup to nuts whether the homes are multi-million dollar spectacles, or your basic blue-collar inherited beach bungalow. But regardless, I still think of Sandy, and the poor people on Staten Island and Long Island shoveling the 3-5 feet of sand out of their kitchens. . . whose kitchen is safer, I wonder. And here is my “favorite house,” which I remember clearly from our trip north over ten years ago. . . The Pink House, perched upon its own little island! The bridges can be problematic along this stretch. Not the ones that are at a fixed height of 65 feet, but the old swing bridges and bascule bridges. They are almost always on a schedule, with very few opening “on demand.” Sometimes it’s “every hour on the half hour,” sometimes it’s “on the hour only.” Well, if you get to the bridge that opens on the hour, and the next bridge down doesn’t open until the next “on the hour,” but it’s three miles away. . . well. You have to be very patient really. 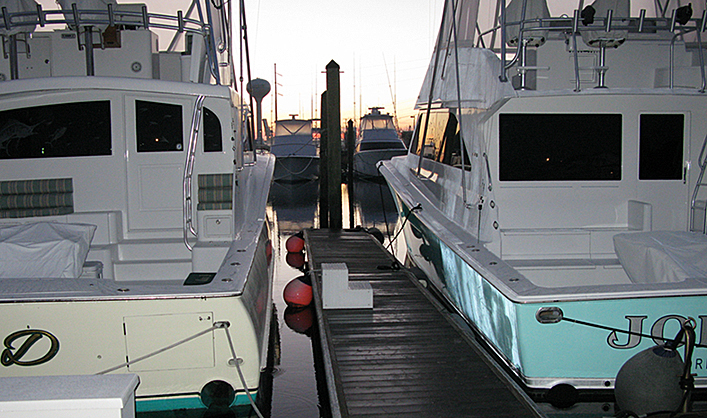 When we arrived at our marina, the Seapath Yacht Club Transient Docks in Wrightsville Beach, a fishing boat came in at the same time. Directly next to us was one of the fish cleaning stations. They had quite a successful day apparently, with these only a sample of what they caught. It was fascinating listening to the captain as he cleaned the fish for the men who had hired him. He said there was a Great White Shark that came into Myrtle Beach last week, traveling up and down the coast (sniffing out a tantalizing treat??) and then went back out again to head south. She was tagged, so they “knew” her. She weighs over 3,000 pounds — so cool that she is being tracked, I love it! He said that there was a hump back whale just off the coast recently as well. Wonderful stuff. We have a lovely view over some of the marshy islands next to the dock, as we are on the “face dock” with a side tie — our favorite as it’s easy to get off in the morning. Someday soon we will stop in a place where we can stay for a few days or more, and smell some roses. (NOT here, for sure, at $2.00 a foot. . . ) One of our good boating friends, Jim Roberts (a wise and seasoned cruiser!) said in an e-mail today that if we keep up this pace we will be in Cuba before Christmas. That’s just how it feels! Gotta slow down. This time of the year I say just get South. You can smell the roses in the spring when they will actually be in bloom!!! Glad your having such a great time. Can’t wait to see you!! Tonight won’t be the same without you. I’ll be there. . . ! We’ve been incredibly lucky with the weather, which is why we’re going so fast. . . I’m really ready to slow down, and it looks like we’re coming up on a couple of days when we’ll be doing just that. Hello Hans & Peggy,Been watching your adventure daily.Looks like your having a great time.Whos taking all the wonderful pictures.Must be Peggy.Oh by the way Hans .Its a CH53E ,not the Green Giant.Flew that coastal many times when I was in the USMC.Have a great time and be safe. Chris,Sharon and My little grandson Ilarion..
More great pictures!!! You deserve every beautiful day you’ve been enjoying, and then some! I see some weather coming down from the north, though, so perhaps Charleston for a day or so? Can’t believe you’re already in SOUTH Carolina!!! Great going!! Yep, we see the weather as well . . . tomorrow is Georgetown, and we will either stay there for a few days or go on to Charleston for a few day. We’ll see. I’m ready for a few days of kicking back a little, shopping a little, and whatever else comes along. It’s DEFINITELY warming up! We have palm trees, Christmas wreaths and short sleeve t-shirts. Forget socks, except in the morning, when it can still be quite chilly.